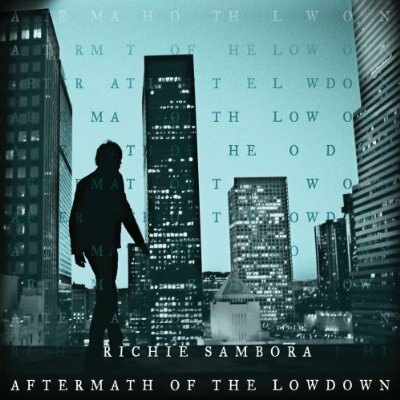 Richie’s third solo effort but 14 years since the previous release, Richie Sambora has seen fit unleashed Aftermath of the Lowdown on the world. Probably an outlet for songs he knows Jon would never allow on a Bon Jovi album though there are a few tracks here I could see making it like the lead single “Every Road Leads Home to You”, “Learning to Fly with a Broken Wing” and the ballad “Seven Years Gone”. The album is kind of all over the place in terms of style. “Burn That Candle Down” has a 1970s Hendrix/Deep Purple vibe to it, “Every Road Leads Home to You” is pure Bon Jovi (you can definitely hear Jon singing this one), “Taking a Chance on the Wind” is rock ‘n’ roll with some soul behind it, “Nowadays” is somewhat punky & poppy, “I’ll Always Walk Beside You” sounds like Coldplay, “World” sounds like Bowie, etc. “Weathering the Storm” is another song that sounds similar to modern Bon Jovi. Richie even seems like he’s trying to sound like Jon so I’m assuming maybe this was written with Bon Jovi in mind. It was co-written with Bernie Taupin though, who is a long-time collaborator with Elton John. Don’t get me wrong though, I like Jon Bon Jovi’s voice but Richie is a better singer. “Every Road Leads Home to You” and “Seven Years Gone” wouldn’t be nearly as good without Richie’s powerful, emotional soulful performances. Even if the sounds may have been inspired by other acts, some of these songs just have to be autobiographical lyrically such as “You Can Only Get So High” and maybe even the album title itself. Richie had some alcohol issues in recent years so other than recording songs that may have not been recorded anywhere else, I’m sure this album was very cathartic for him in dealing with his alcoholism and relationship troubles. It’s a good album and while there are some similarities to Bon Jovi with a couple of songs, there’s enough variety here and true bluesy emotion coming through Richie so that the album doesn’t come off like a bunch of unreleased Bon Jovi tracks.